Every two years, the NASA astrophysics division holds a “senior review” to analyze their current missions. In NASA parlance, the point of the process is to create “comparative reviews of Mission Operations and Data Analysis (MO&DA) programs to maximize the scientific return from these programs within finite resources.” In other words, NASA’s goal is to determine which missions are providing enough bang for their buck to warrant a 2-year mission extension and which should be shut down. For those that work on or use data from a NASA mission, these reviews can be a stressful process! It’s a time of uncertainty, with every space telescope on trial. This doesn’t mean it will necessarily end poorly: the 2012 senior review analyzed nine missions and decided all were worthy of being granted funding for the next two years. Like any good superhero franchise, all nine missions are back for more this year, and have been joined by two new missions for this cycle. Given the current level of funding in the NASA astrophysics budget, it seems unlikely that NASA will find the funding to support all 11 missions. In fact, the possible end of a 12th mission was recently announced: SOFIA will cease operations at the end of this year unless an operational partner is found. With this in mind, let’s take a look at the players in this upcoming review. 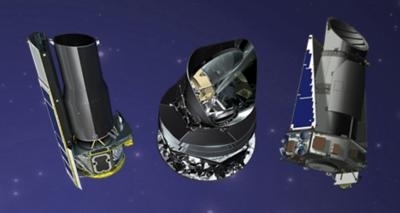 (Left to right) Spitzer, Planck, and Kepler are just three of the missions that face NASA’s senior review. Eleven missions are participating in the senior review. Eight of these missions are asking for funding to continue their extended missions. These are Hubble, Chandra, Fermi, Planck, Spitzer, Suzaku, Swift, and XMM-Newton. These missions all have previously proven to be successful; their goal is to convince NASA that they should receive funding to continue their missions. Two missions will participate in the senior review with the hope that their decommissioned telescopes can be repurposed for new science. Kepler has been rebranded K2, and hopes to gaze near the ecliptic plane to study planets and stars, as we’ve previously discussed. WISE, the Wide-field Infrared Survey Explorer, which mapped the entire sky in the infrared, has become MaxWISE and will search for nearby asteroids and other near-Earth objects. The proposed mission is a continuation of NEOWISE, the first rebranding for this telescope after its primary mission ended in 2011. Finally, NuSTAR will encounter its first senior review. As a part of its extended mission, the X-ray telescope hopes to begin a Guest Observer program. As is common for missions in their extended program, anyone will be able to write a proposal to use the telescope for their science if NuSTAR passes the review. These missions are very different: Chandra costs more than 50 million dollars per year, and Hubble nearly twice that, while Suzaku costs only 1 million. Hubble has been around for 24 years, while NuSTAR was launched in 2012. Observations range from the mid-IR to hard X-rays, and spacecraft range from a few hundred miles from Earth to tens of millions of miles away. Each mission prepared a 30-page document outlining their science goals for the next 2-4 years. These documents were to focus on the expected future impact of the mission, the broad accessibility and usability of the data, the health of the instrument, productivity of the science team, and quality of observatory stewardship (explicitly, “maximizing scientific return while minimizing costs”). Teams were also asked to prepare a detailed budget outlining expected costs. Each mission then sent three representatives to Washington last week to give presentations to the panel. These presentations were 90 minutes long and are intended to allow the panelists to ask questions they may have from the initial proposals. All missions have submitted their proposals already, which have been (hopefully!) carefully read. The senior review panel met in Washington last week (31 March-3 April), and will deliver their report to NASA on 1 May. NASA will consider their recommendations and make final decisions by 15 June, 2014. Be sure to cross your fingers for your favorite mission! Additionally, the planetary science division will also have a senior review this summer, in which Cassini, the Lunar Orbiter, Curiosity and Opportunity (my personal favorite! ), will be among the missions competing for continued funding. NASA Senior Review Favors Kepler The Spitzer Space Telescope: An Uncertain Future The Midterm Assessment: How’s it coming? Welcome to Mars, MAVEN and MOM!